Guess what movie hits theaters today? 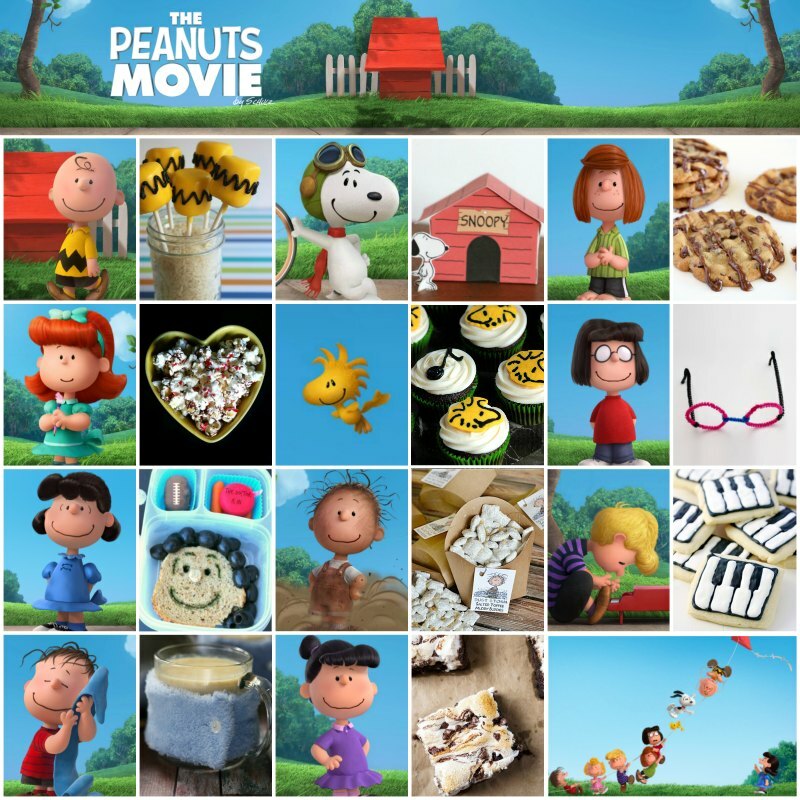 The Peanuts Movie! Call me old school, but Charlie Brown and the gang just make me happy. In honor of its release, I've teamed up with 10 other "Blockbuster Bloggers" to bring you some movie-inspired food and crafts. This month, each of us picked a different Peanuts character to focus on, and I chose my personal favorite, Linus. 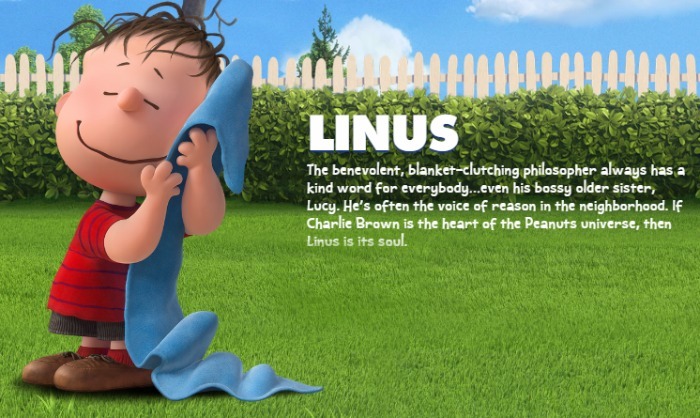 Linus is Charlie Brown's best friend and Lucy's younger brother. He's wise beyond his years and can't function properly without his beloved security blanket. Aside from the blanket, when I think of Linus, I think of The Great Pumpkin. While everybody else dons costumes and heads out trick-or-treating, Linus sets up camp in the pumpkin patch, waiting to welcome the Great Pumpkin. 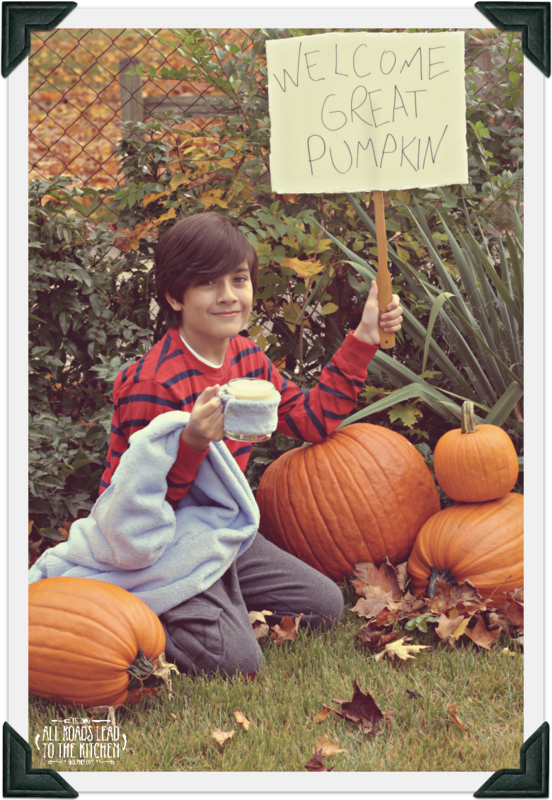 He believes that the most "sincere" pumpkin patch is where the Great Pumpkin will stop and bring gifts. Although Linus has his trusty blanket, I can't help but think how cold he must be waiting in a pumpkin patch on a dark, autumn evening. So, I decided that he needed a mug of a tasty hot beverage to help keep him warm. This white hot chocolate is infused with pumpkin, orange, and a hint of spice. Oh, and the mug gets a little blanket of its own in the form of a homemade cozy (koozie) modeled after Linus's blanket. 1. Use the measuring tape to measure around your mug, between the handle. 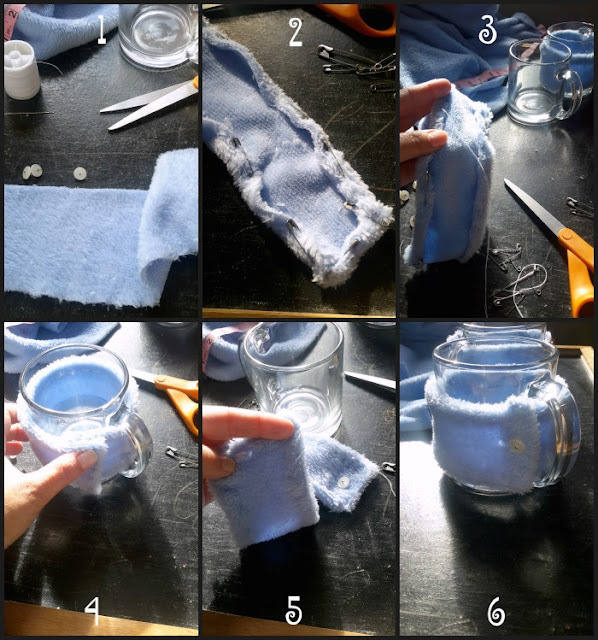 Add an extra inch to the length and the height, and cut a piece of fabric that size. 2. Fold a 1/2 inch of fabric in on each edge ("show" side down), using safety pins to secure the folds. 3. Sew each edge, holding the pinned fabric securely between your thumb and fingers to keep it straight. You can remove the pins from each edge as you finish them (this helps to keep the thread from getting caught on them as you work). 4. Wrap your sewn fabric around the mug, eyeballing where you'd like to place the button and button hole. You could make a mark with a fabric pen if you need to, but I just place a finger on the spot. 5. Sew a button on the spot you eyeballed, then wrap it around again to eyeball the spot for the buttonhole. Fold the fabric over on that spot and snip a very small hole (smaller than the button) in the fabric. 6. 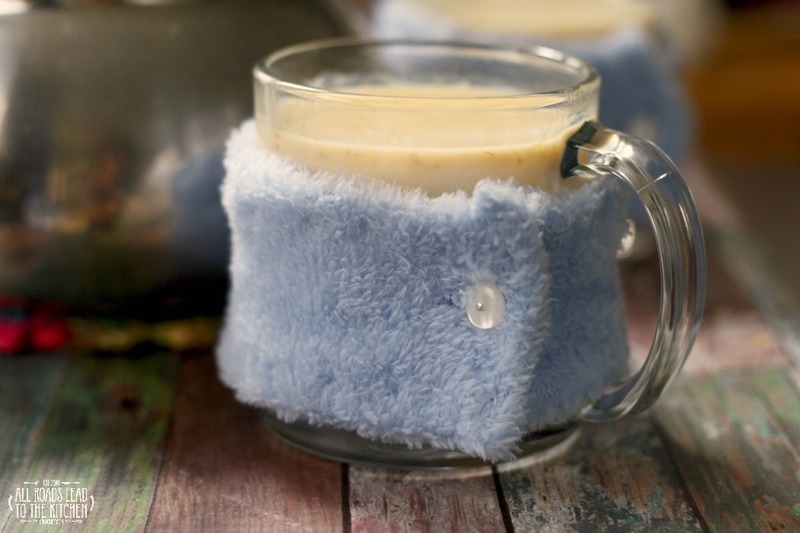 Secure the soft, fuzzy cozy around your mug. Now that you have a soft cozy on your mug, fill it with this "Great Pumpkin" White Hot Chocolate. 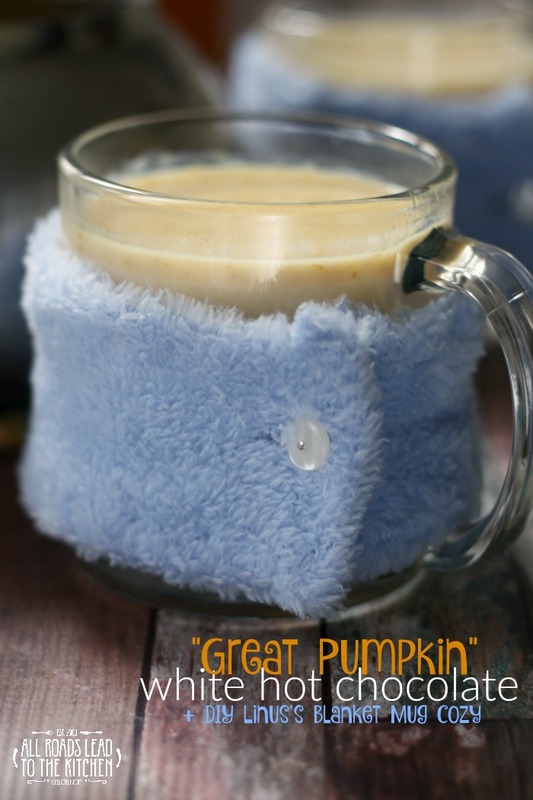 It will warm your bones while you sit outside awaiting the great pumpkin! Rich white hot chocolate infused with pumpkin to celebrate the season. Combine milk, cream, and strips of orange peel in a medium-sized sauce pot over medium-low heat. Bring to a boil, stirring from time to time. Gradually whisk in the white chocolate until it is entirely melted, then whisk in the pumpkin puree until smooth and steamy. Turn off the heat and whisk in almond extract, a few fresh grates of nutmeg, and the tiny pinch of sea salt. Lift out the orange peel and discard. Ladle into mugs and garnish with another fresh grate of nutmeg and some finely grated orange zest, if you wish.